← Mischief Makers: Fond Farewell Folks! The garden bug is nibbling. Every day I wake up itching to get started. 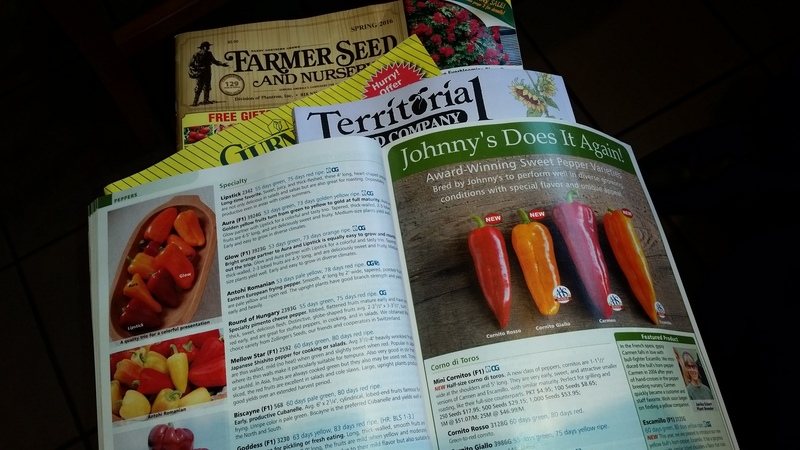 Every week I get more seed catalogs in the mail and tear into them plotting and planning the 2016 Garden. According the the Farmer’s Almanac, the last frost date for my region is April 20, so I’m feeling the pressure to get my seed starting schedule together. This means I need to plan, pick and start planting if I want to start tomato and pepper seeds by the last week in January. In an effort to calm down and feel like I’m taking action, I discovered a good use for the eggshells we’ve been powdering all winter. Scatter. Let the chickens do the scratching. Scatter some more. Egg shells are made of almost entirely of calcium carbonate. Plants need calcium to thrive. And…it’s free fertilizer. All we have to do is throw the eggshells in a pan, let them dry and pulverize them in the food processor. 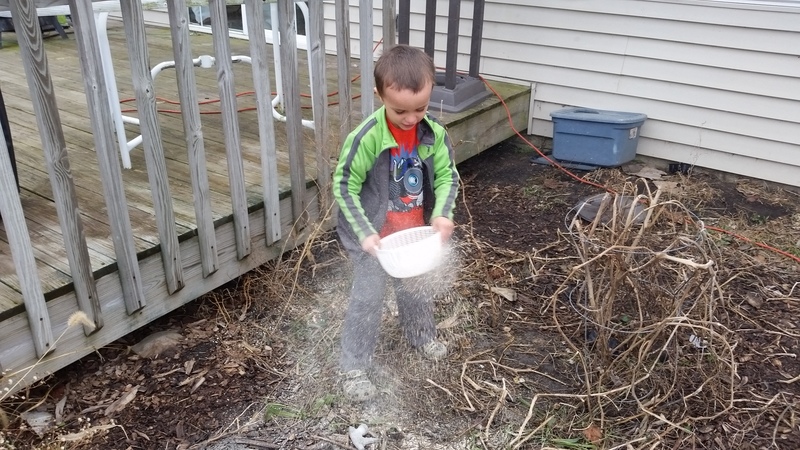 So, armed with two and a half coffee cans full of powdered eggshells and a couple of colanders, the boys and I took turns scattering powdered eggshells all over the kitchen garden. The chickens have been happily preparing the kitchen garden for a month or so now. They scratch, eat the eggs of those pesky garden pests and fertilize the soil with their waste. Now, they’ll help even more by scratching the calcium rich egg shells into the soil. We ended up covering the entire kitchen garden with powdered shells. As the chickens move across the garden they will help scratch and dig and mix the powder in to the soil. 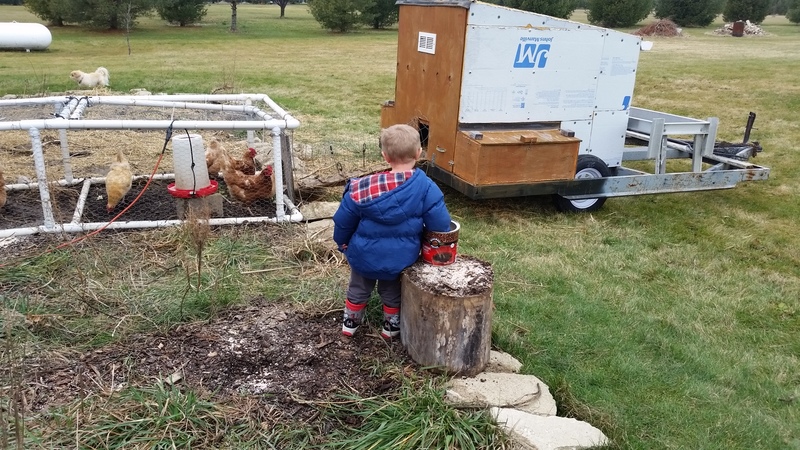 This entry was posted in Chickens!, For the Kids, Garden Stories, Haiku, Life, Permaculture, Writing. Bookmark the permalink.